December 21, 2012 By This post may contain affiliate links. Everyone may not be getting gifts from Santa Claus this year because they are on the naughty list. But these Candy Filled Christmas Present Cookies can be given to everybody. As soon as I saw Sandra Denneler’s Cinco de Mayo Pinata Cookies on SheKnows.com, I knew her concept would be perfect for present shaped cookies. I love giving sweets as gifts at the holidays and am excited to share these with friends and family this Christmas. 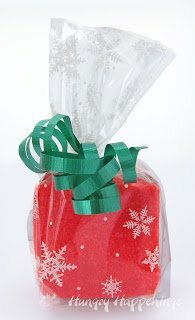 Each little Christmas present cookie has three layers, the center layer has a hole cut into it, so you can hide a sweet surprise inside. I chose to use Christmas M&M minis, which fit perfectly, look festive, and taste great alongside the cookie. My sweet little cookie gifts are decorated using modeling chocolate. If you are a regular reader here, you know it is my go to decorating medium. 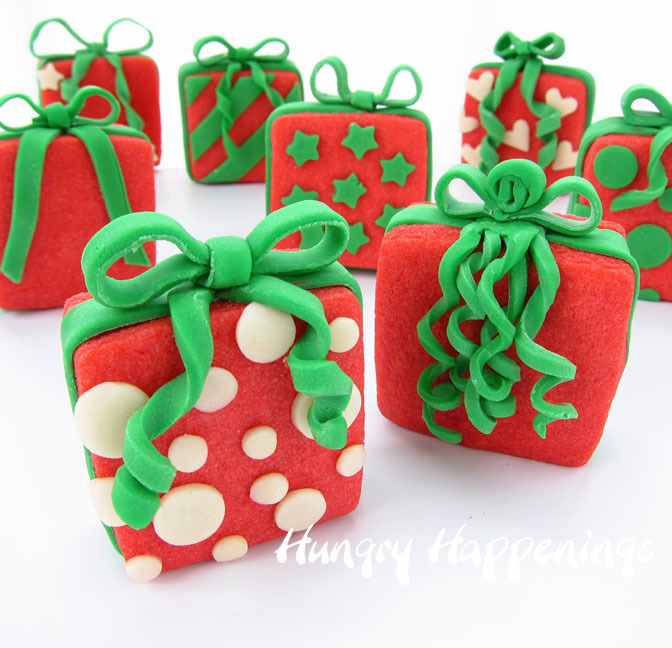 I’m not a big fan of the flavor of fondant, but if you are, you can use it to decorate your cookies, instead. My exchange student and I had a lot of fun designing each individual cookie. My favorite is the polka dot pattern. You can make them as detailed or simple as you like. Mix flour, salt, and baking powder together in a bowl. Set aside. Cream butter and sugar until light and fluffy. Stir in eggs, vanilla, almond extract, and some drops of red food coloring. Add more coloring until you reach the desired shade of red and mix until well combined. Add dry ingredients and stir just until it’s mixed in. Don’t over mix or you will end up with tough cookies. 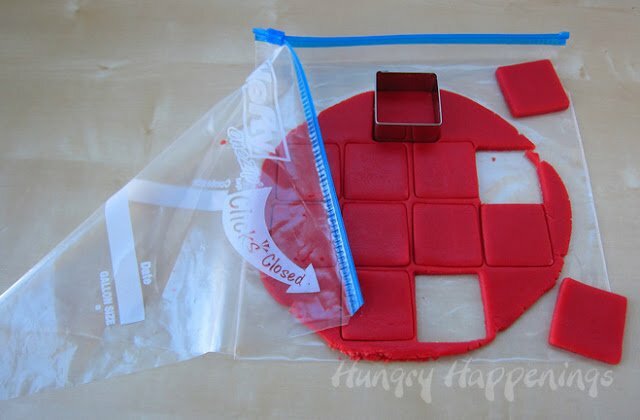 Roll your cookie dough out either on a flour dusted cutting board or use this wonderful trick which will not only keep your cookies bright red, but will also keep them from drying out after re-rolling. First, you need to cut the seams along two perpendicular sides of a gallon size zip top bag. Then, pinch off some of your dough and place it in the zip top bag. Roll the dough out to 1/4″ thickness.I love to use rolling pin rings (the green bands at both ends of my rolling pin) when I make cut-out cookies so I get nice evenly thick cookies. Simply open the bag along the cut seams to expose the cookie dough. 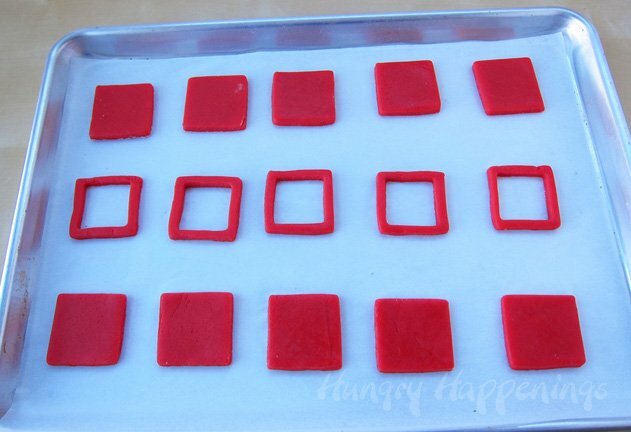 Then, cut out squares using a cookie cutter. Place the cookies on a baking sheet lined with parchment paper. Use a small square cookie cutter or a knife to cut the centers out of one third of your cookies. Refrigerate cookies for 30 minutes.Meanwhile, preheat oven to 375 degrees. Bake cookies for 10-12 minutes until just the edges begin to brown. Allow cookies to cool completely. Color vanilla frosting with red food coloring. 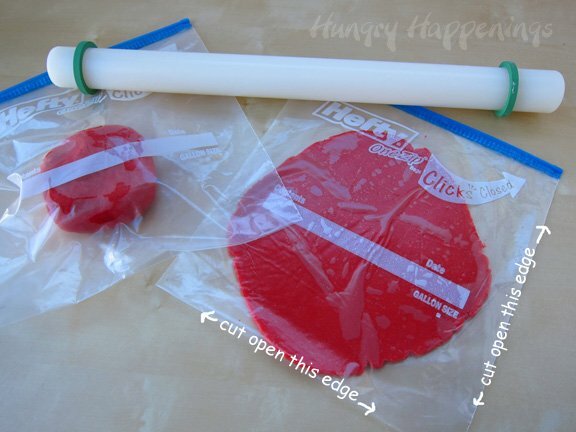 Fill a disposable pastry bag or a zip top bag with frosting. Snip off the end of your bag. Pipe a thin line of frosting on the back size of the squares with the hole in the middle. 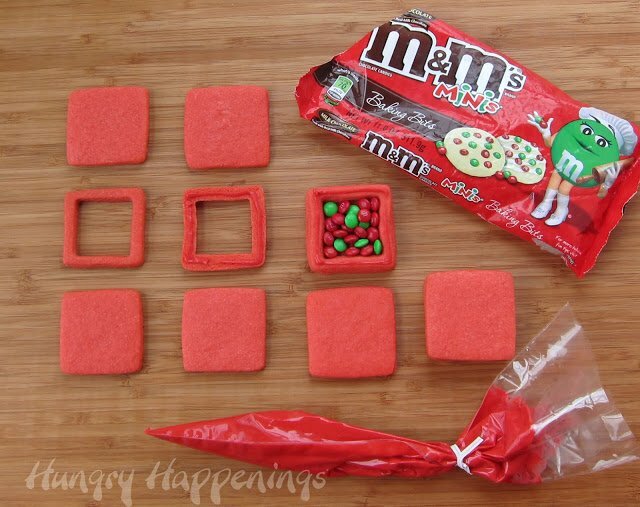 Press onto one of the square cookies. Fill the hole with small candies. Pipe a thin line of frosting around the edge of the cookies with the holes. 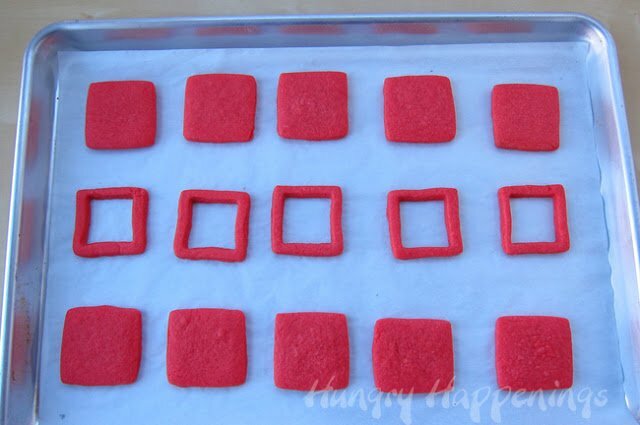 Press a square cookie on top. Allow to dry for at least 45 minutes, before decorating so the frosting has time to dry and the cookies stay together. Color some of your white modeling chocolate using green food coloring (see instructions, here.) Dust your work surface lightly with powdered sugar. Roll out the modeling chocolate to 1/16″ thickness. Cut green modeling chocolate into long strips. Brush the backside of the strip with corn syrup. 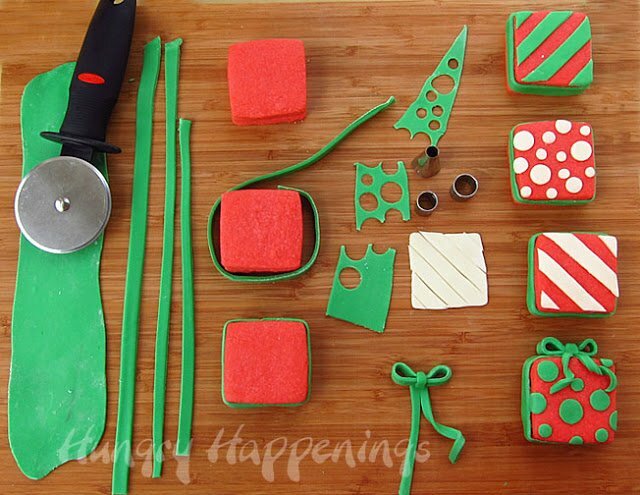 Wrap the green strip around the middle cookie, cutting off the excess. The nice thing about adding this strip of modeling chocolate, is it completely covers up the seams between the three cookies, so your Christmas present cookies really look like gifts as opposed to three cut out cookies stacked on top of each other. Use corn syrup to attach all the other decorations. Add a bow and some ribbon, if you want. 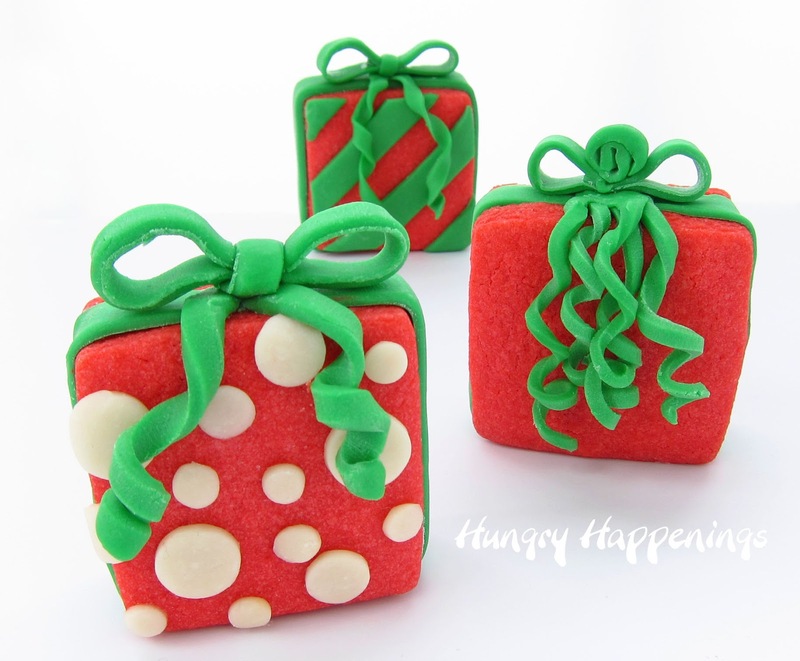 Cut out shapes using mini fondant and clay cutter and add to the front of your Christmas present cookies. 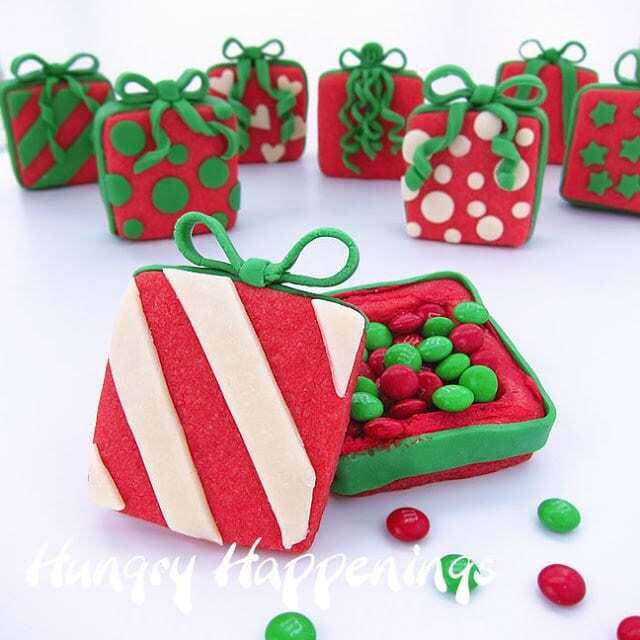 To make striped cookie gifts, cut out squares using the same 2 inch cookie cutter, then cut stripes diagonally, removed every other stripe and attached them to your cookies. Store your Christmas Present Cookies in an airtight container for up to a week. Set on a nice platter and serve on Christmas day for dessert, or wrap them in cellophane bags and give as party favors or gifts. 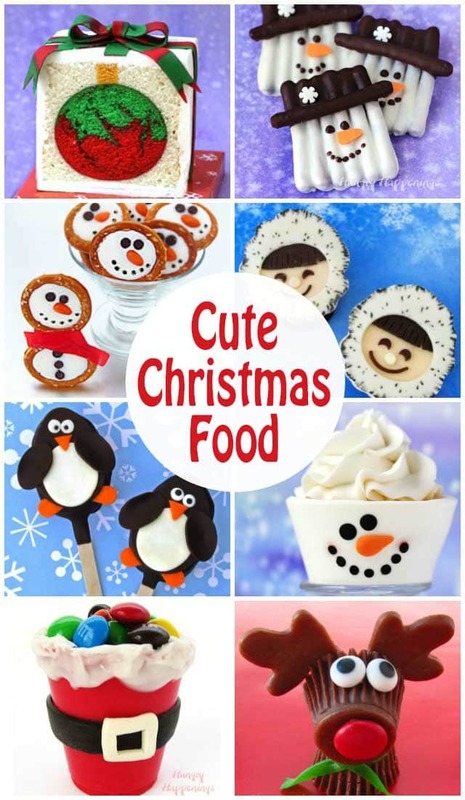 You can bake and freeze your cookies for up to 3 months, then remove them from the freezer, thaw, and decorate, if needed. HOw completely AWESOME is this!! I just had to tell you that we made your reindeer hershey bar in my daughters class today. They LOVED it, I looked like a HERO but I did tell the mom's about your website, we pulled it up on my ipad and they were mesmerized by your talent. I let them all know I was sharing an important SECRET WEAPON with them…HA! Merry Christmas to such a big inspiration for me. I'm so happy to hear you made them with the school kids. That is fantastic. Thanks for sharing my site with everyone! What a sweet surprise – first the beautiful cookies and then to find out there's more inside! Great idea! You totally blow my mind. These are great and can work for any holiday. Wow these are so cute!! Am having a christmas party coming up and are so using these!! My daughter couldn’t stop smiling when she saw the picture of them! Thanks for such a creative idea! So talented! I think I will make these for my friends this year. To save time though, I’m planning to marble the cookie dough with red and green, then I’ll just do the strip to cover the seams and the bows/ribbons. Also, I think I’ll fill these with some cute shaped sprinkles! This is a wonderful idea and I can’t wait to use it for all kinds of occasions!